Internet suspended, section 144 imposed in various parts of the city. Two persons were reportedy killed, and over 40 injured as clashes broke out between two communities in Maharashtra’s Aurangabad city on Friday night. The clashes apparently broke out after an argument between two groups of youth in Gandhinagar after the municipal corporation cut water connection in the area, including to a ‘religious place”, according to an ANI report. With rumours spreading fast and several parts of Aurangabad tense on Saturday morning, Internet was suspended and section 144 was imposed in various parts of the city. 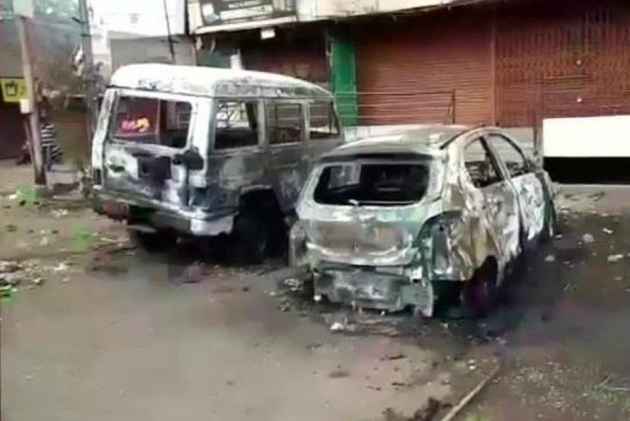 Over 40 vehicles were torched, shops from Shahgunj and Chelipura area were set on fire. Meanwhile, at least ten policemen have been injured including three junior officers, the Indian Express reported. The Maharashtra home minister appealed to “maintain peace and urged to not believe in rumours”. He also said that two people had lost their lives and several have been injured, adding that many police officials had been injured during the clashes, according to an ABP News report. During the night, several incidents of stone pelting and arson were reported. In certain pockets, police resorted to lathi-charge and lobbing tear gas shells to control the crowd. “I would like to appeal to the people of Aurangabad to remain peaceful and not taken law unto themselves,” said Aurangabad acting police commissioner, Milind Bharambe. For the last two months the city doesn’t have a full-time commissioner, the Indian Express said. According to the police, a ‘minor’ argument broke out between members of two communities in Gandhinagar area which resulted in downing of shutters by many local shopkeepers. The tension, coupled with rumours resulted in stone pelting in the adjoining areas of Motikaranja, Raja Bazar, Shahgunj, Chelipura, Anguribagh. Heavy police force has been deployed in sensitive areas and around 100 people have been arrested.